My journey in figuring out how to generate interesting 2D environments. I’ve always been a fan on procedural generation, not only for environments, but also for entities (enemies, items, weapons, etc.). However I don’t think at all the procedural generation is “better” than user-made content. Procedural generation works best when the entire game is designed around it, when level design doesn’t require a lot of creativity or when the elements are simple enough that any level will be fun to play. User-made content is still superior in most of the results, but it is obviously more consuming in terms of development times. Also, even though I never experimented with it a lot, I’ve always liked the idea of mixing user-made content with procedural generation. 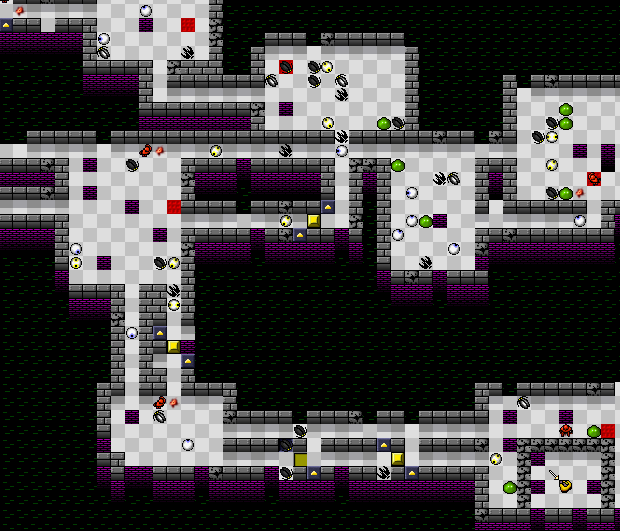 An example could be levels made up of user-made rooms attached together randomly. Something similar is modular item creation, like in Borderlands, where developers create a lot of pieces and then the system attaches them together randomly, creating interesting results. I think that procedural generation is a very powerful tool, it can help you save precious development time on content creation and also dramatically increase any game’s re-playability. I think it is suitable for any game genre, in one way or the other - it shouldn't be limited to roguelikes. This probably was my first test, made in 2009. It is very simple, it generates empty rooms in a wall-filled 2d array, then carves a path from every center of the room to the other centers. It generated predictable and boring levels. It is an example of what not-to-do. I stopped experimenting with procedural generation after a while, and worked on other stuff. That’s when I started getting into a puzzle game, called DROD (Deadly Rooms of Death), which caught my attention for a lot of time, so I decided to make a clone of it. 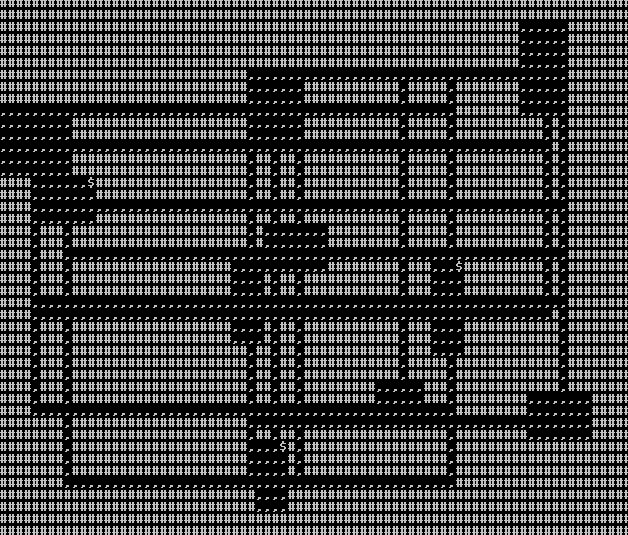 In 2011, I started experimenting with pathfinding. I had the idea of randomly generating levels by placing rooms around in a big open space, then pathfinding from the first one to the next one, until they were all connected. This was my first attempt: http://www.youtube.com/watch?v=Ve0s8109Erg As you can see, it was slow. It also added doors on random room outline tiles. I improved it a bit later, rendering tiles with SFML.NET. Also added a simple player entity and basic collisions: http://www.youtube.com/watch?v=NDeM5oQyve8 This is much more interesting than the DROD Roguelike one, because it doesn’t create overlapping rooms and paths, which can lead to unintended solutions or simply bad-looking levels. The generated levels could also be retrieved as a connection of nodes (a graph). This was incredibly useful, because you could actually write some clever code that automatically added keys and doors that were accessible only in a specific order and make levels less linear. his is still my favorite approach - it could also be sped up by using Jump Point Search instead of A*. In retrospect, the API could be highly improved, but the functionality is still there. I have a video explaining most of the features right here, check it out: http://www.youtube.com/watch?v=d0ByM6mkce4 The cool thing about VeeGen is that you can mix'n'match different generators. Areas allow you to use a generator in a certain part of the world, and another generator in another part. 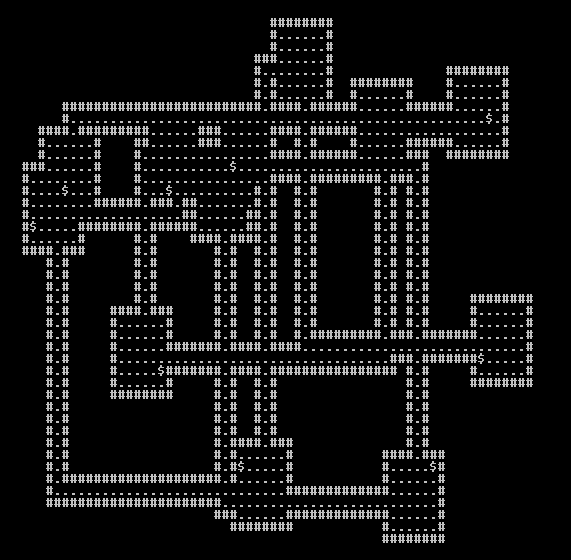 With some interesting code you could create dungeons with rooms filled of caves, for example. Or a large open world with dungeons and caves placed randomly But even more interesting is the fact that you can use more generators in the same area. You can see in the video (and try it for yourself in the demo) that it is possible to generate a dungeon on top of a cave, then, hypothetically, have some walkers carve some additional paths and rooms in the dungeon. The possibilities are endless, and creating custom generators shouldn't be hard at all.